The Greenish Tint Seen On The Edges Of Tempered Glass Is Caused By? Which Video Game Company Got Their Start Manufacturing Playing Cards? If you have any tempered glass table tops in your home or office, you’ve likely noticed that the edges of many sheets of tempered glass have a greenish tint. Despite the glass looking perfectly clear and neutral when viewed from above, when viewed from the edge there is a distinct coloration. Why? 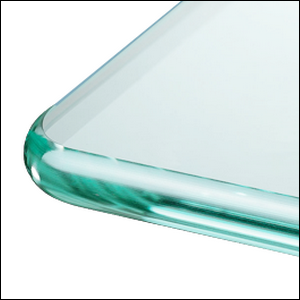 The green tint found in most tempered glass is a result of iron used in the production of glass sheets, where it is added as an ingredient to act as a lubricant. In fact, except in manufacturing processes designed to minimize iron use to avoid the green tint, you’ll find that green cast in all sheets of glass–not just tempered glass. The green tint doesn’t become as apparent until the glass is of a certain thickness, however, so you don’t notice it when looking at a very slender piece of glass sheeting (like the plate glass in windows or picture frames). Typically, thicker sheets of glass are tempered for safety for their use in table tops, showers, and so on, and people have come to associate the green tint with the tempering process (even though a sheet of regular glass of similar thickness would look just as green).